Take a guided tour around West Virginia’s State Capitol and marvel at its dazzling dome, which is covered in 23.5-karat gold. 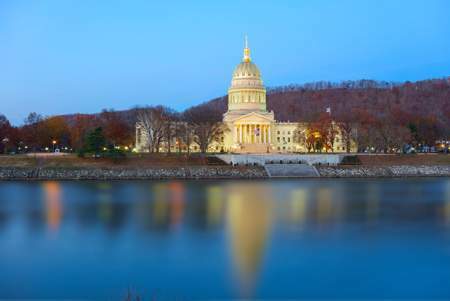 The classical-style West Virginia State Capitol occupies a scenic site facing the Kanawha River. It is among the most impressive buildings in Charleston. Make reservations in advance to join a 30-minute tour of the Capitol building, which houses the West Virginia Senate and House of Representatives. The building was constructed in three stages between 1924 and 1932. The architect behind it was Cass Gilbert, who also designed the U.S. Treasury Annex and the U.S. Supreme Court in Washington, D.C. View the impressive structure from across the banks of the Kanawha River to admire the building and its reflection in the swirling waters. Note the shining dome at its top. At 293 feet (89 meters) high, it is 5 feet (1.5 meters) taller than the dome of the U.S. Capitol in Washington, D.C. Return to see the West Virginia Capitol at night, when the gold-leaf finish of the dome shimmers under the illuminating light. Arrange to have a guide show you around the interior and tell you more about the history and function of the building. Alternatively, download a map from the website and navigate the grand halls and chambers independently. Don’t miss the Rotunda, which features a huge 4,000-pound (1,800-kilogram) chandelier. If the legislature is in session during your visit, head to the galleries to observe. When you get hungry, stop at the food court in the basement for a meal or drink. Walk around the surrounding plaza too. Look for fountains, flagpoles and statues, including one of Abraham Lincoln. The West Virginia State Capitol is located in the West Virginia Capitol Complex in Charleston, which also contains the Governor’s Mansion, the Culture Center and the historic Holly Grove Mansion. The complex is open daily, from morning until evening Monday to Friday and with reduced hours on weekends. If you drive here during the week, bring along quarters to feed the meters.